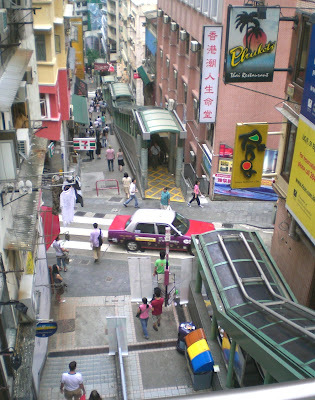 Maximizing Progress: Urban Escalators ~ Hong Kong's 800m System! I've written about various funicular solutions for moving people up hills, and about various uplifting innovations, and even about the Norwegian Trampe bicycle-assist escalator, but this Hong Kong urban escalator is a truly epic innovation! "Since [the Central–Mid-levels escalators] was officially opened to the public on 15 October 1993, the elevator system has played a very important role in pedestrianising the Western District. 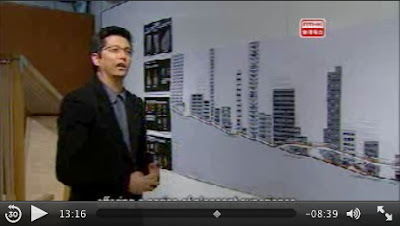 It links Des Voeux Road in Central with Conduit Road in the Mid-levels, passing through narrow streets. The daily traffic exceeds 55,000 people, although originally forecast 27,000. The escalators are 800 metres (2,600 ft) long with a vertical climb of 135 metres (443 ft). The total travel time is twenty minutes, but most people walk while the escalator moves to shorten their trip. Due to the geographical situation, the same distance is equivalent to several miles of zigzagging roads if travelling by car. It consists of twenty escalators and three moving side-walks. According to Guinness World Records, these escalators together form the longest outdoor covered escalator system. The escalator daily runs downhill from 6:00 a.m. to 10:00 a.m. and uphill from 10:30am to midnight. Apart from serving as a method of transporting, it is also a tourist attraction and has restaurants, bars, and shops lining its route. There is an entrance and exit on each road it passes, often on both sides of the road."